Packaging and labeling in accordance with the military standards can be complicated. The more information you have the better. This page includes the official Mil-Std 129R military standard and DOD RFID Supplier Guide. Also included are helpful guides from DCMA. With Mil-Std-129 Revision R the DOD continues forward in its migration away from the use of linear bar codes that have served the defense industry well for the past thirty-five years but no can longer carry sufficient data to support the modern automated supply chain. The major driver of these expanding data requirements is the need to identify serialized items, those with serial numbers or Unique Identifiers (UID/IUID/UII). Linear bar codes are not efficient for this purpose, and in actuality are not even capable of representing a full thirty-character serial number on a standard label, much less a fifty-character UID. 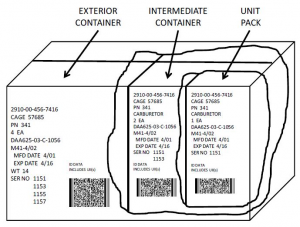 By replacing the numerous linear bar codes required under Mil-Std-129P(4) with a single two-dimensional PDF417 symbol, the DOD makes it possible for automated data collection systems to read all of the information about a shipment, including the UIDs and serial numbers. The linear bar codes lack intrinsic data identifiers, requiring the user of a bar code reader to manually identify and map the bar code data into the data system. By contrast, the PDF417 symbol is a complete data structure that includes data identifiers that allow automated readers to understand and process all of the pertinent label data without assistance from the user. This all can happen as containers roll down conveyor belts, as now happens with automated RFID-driven material handling. Gone in Mil-Std-129R are the numerous linear bar codes that crowded labels under with Change 4 of Mil-Std-129P. 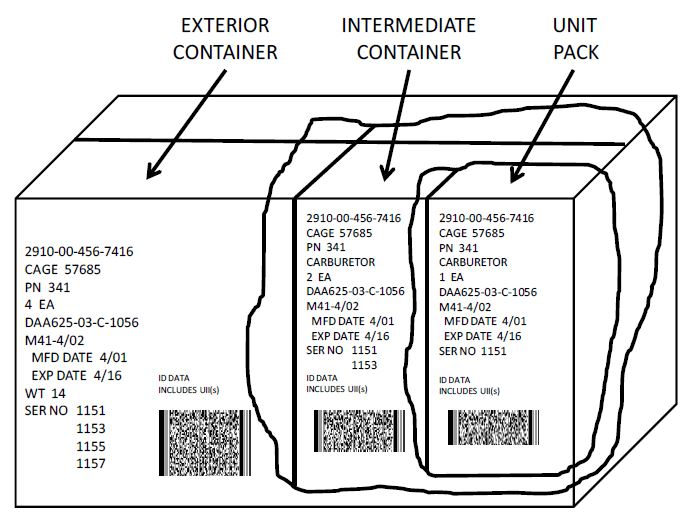 A single two-dimensional symbol (PDF417) replaces the need for the ten linear bar codes that were required by that standard for NSN, shipment, contract, CLIN, CAGE and (up to) five UIDs or serial numbers.